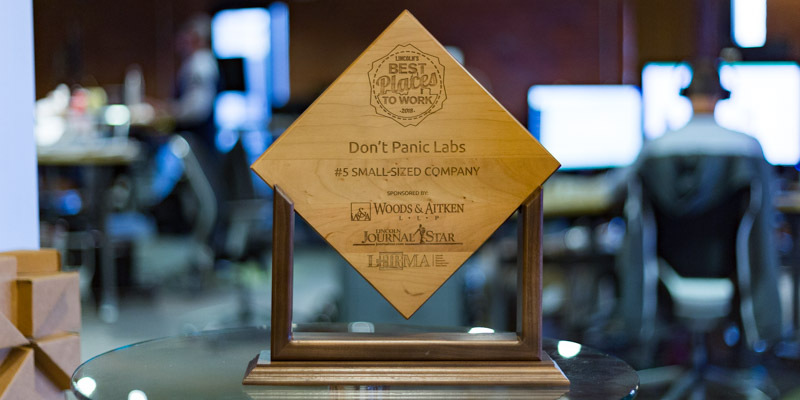 Software design and engineering firm Don’t Panic Labs was recognized as one of Lincoln’s Best Places to Work at an award luncheon on April 19th at the Cornhusker Hotel. The company was recognized in the Small company category by Woods & Aitken LLP, the Lincoln Journal Star, and the Lincoln Human Resource Management Association, founders of the Best Places to Work in Lincoln list. The Best Places to Work in Lincoln program, which was started in 2013, recognizes local companies who, through a third party administered employee survey, rank their respective companies as being the best places to work. The areas surveyed are varied parts of employee life, including workplace environment, leadership direction, culture, and management practices.